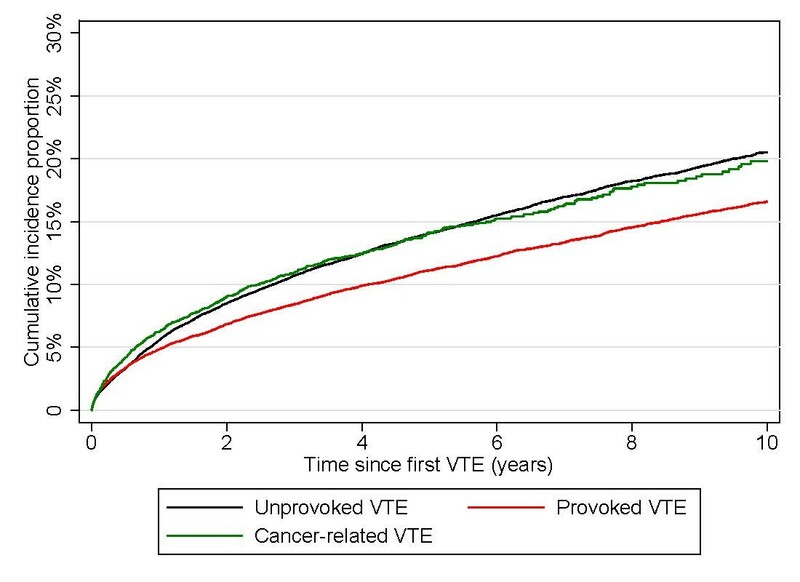 At a 10-year follow-up, patients with unprovoked VTE (without cancer or any provoking factor) and cancer patients had the highest risk of recurrence compared with patients with provoked VTE. Cumulative risk of recurrent venous thromboembolism (VTE) by incident VTE-type at a 10 year follow-up. Estimated using the cumulative incidence function taking into account the competing risk of death. “Given the high risk of recurrence among all the types of incident VTE, it is worth discussing if the current recommended treatment duration after VTE according to clinical guidelines is optimal,” noted Dr. Albertsen. “To optimize duration of anticoagulation, we may need to rethink the arbitrary categorization of provoked/unprovoked when risk stratifying patients with incident VTE and aim for more nuanced risk stratification." The article is “Risk of Recurrent Venous Thromboembolism: A Danish Nationwide Cohort Study,” by Ida Ehlers Albertsen, MD; Peter Brønnum Nielsen, MSc, PhD; Mette Søgaard, DVM, PhD; Samuel Zachary Goldhaber, MD; Thure Filskov Overvad, MD, PhD; Lars Hvilsted Rasmussen, MD, PhD; and Torben Bjerregaard Larsen, MD, PhD (https://doi.org/10.1016/j.amjmed.2018.04.042). This article appears in The American Journal of Medicine, volume 131, issue 9 (September 2018) published by Elsevier. Full text of this article is available to credentialed journalists upon request. Contact Jane Grochowski at +1 406 542 8397 or hmsmedia@elsevier.com to obtain copies. Journalists who would like to interview the authors should contact Ida Ehlers Albertsen at +45 25 88 28 37 or idaehlers@gmail.com. View video at www.youtube.com/watch?v=vfz7sF31l2Y&t=2s. The Obel Family Foundation partly funded this research by an unrestricted grant. The sponsor had no role the design and conduct of the study; collection, management, analysis, and interpretation of the data; in the writing of the report; and in the decision to submit the paper for publication.